'Nineveh' OB- ( Keith Keppel, R. 1965). Seedling 60-33A. AB, height 30" (76 cm). Early bloom. Standards litho purple, flushed brown at base; Falls red violet washed warm brown; dark brown beard. 'Bang' X 'Capitola'. Keppel, 1966. High Commendation 1965; Honorable Mention 1967; NTG Award 1968; Judges Choice 1967, 1968; Mohr Award 1969. From AIS Bulletin #181 April 1966. Introducing NINEVEH E 28" Bang X Capitola. Nineveh was the wicked Assyrian capital of biblical times. The iris Nineveh looks wicked! 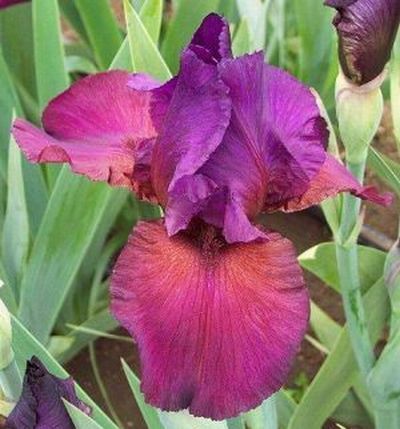 Silken standards of magenta-toned violet; falls blended magenta and tan, the tan predominating in warm weather. Beards a mysterious rust-brown. Blooms large, long-lasting, with rounded falls that are flared or even upswept at the edges. Stalks carry three to five blossoms; several stalks per rhizome when well grown. Very limited fertility. Kerr Regional Award 1965. HC (18 votes) 1965. $20.00. Keith Keppel.